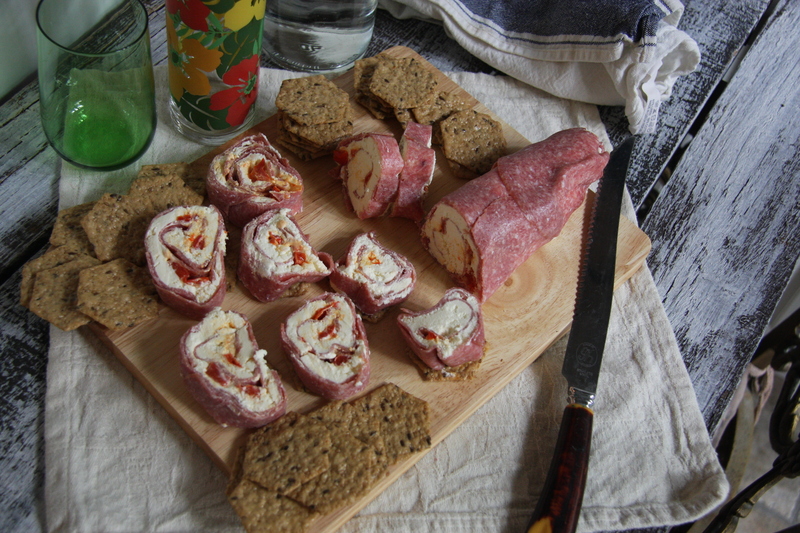 If you want an appetizer that doubles up for sandwiches, this is it. I’m always trying to simplify things now. I LOVE to cook but there are times I want to be in and out of the kitchen. Though, at the same time I don’t want things to get boring. I’ve always been an advocate of what you can do ahead, get it done. Also, make more so you don’t have to cook tomorrow or the next day and why make a mess twice, especially for the same recipe. This recipe will keep in the fridge wrapped in saran wrap. Use it for sandwiches, on crackers, even on a burger or along side a salad. It is fantastic to have on hand if someone happens to drop in. Give it a try and let me know what you think. In between 2 pieces of saran wrap place the 2 packages of cream cheese. Roll out with a rolling pin. And flip it so the salami pieces are on the bottom. Remove the saran. 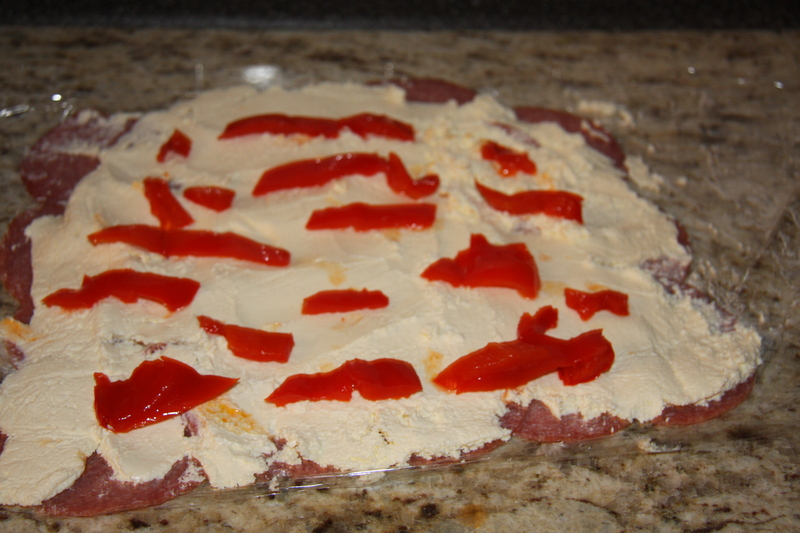 Place the sliced roasted red pepper pieces all over the cheese. With the aid of the saran start to roll the edge, like you would for a jelly roll cake but as you roll gently press the log. Once completed, wrap the log and tighten the ends. 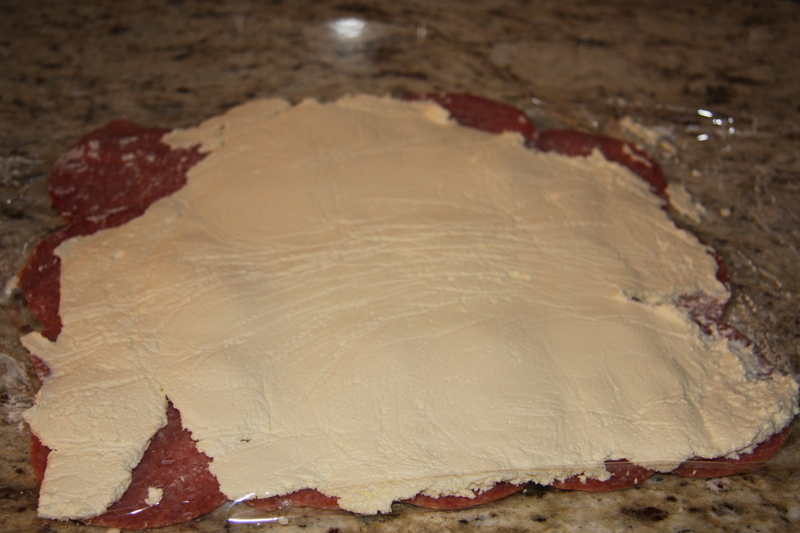 Refrigerate for 6-8 hours to make the slicing easier. You can at this point slice it but much easier if done after being refrigerated. In between 2 pieces of saran wrap, roll out the cheese. Remove the saran wrap. 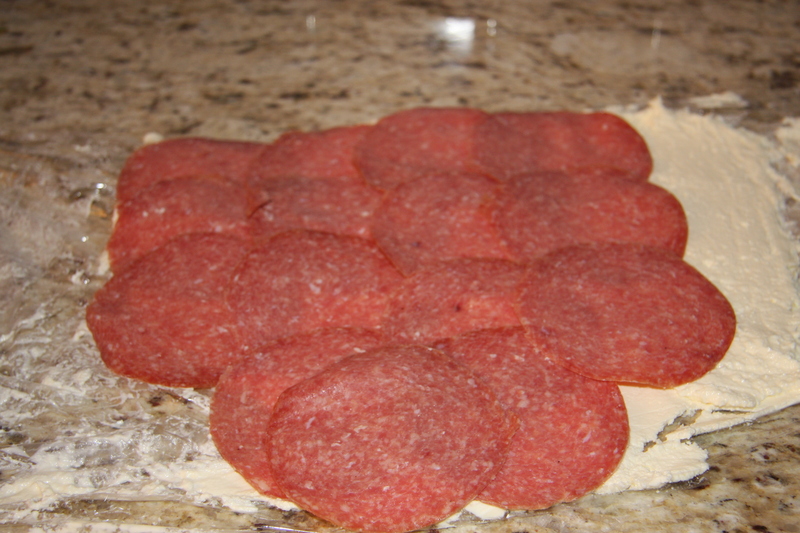 Place salami, overlapping the slices on top of the cheese. 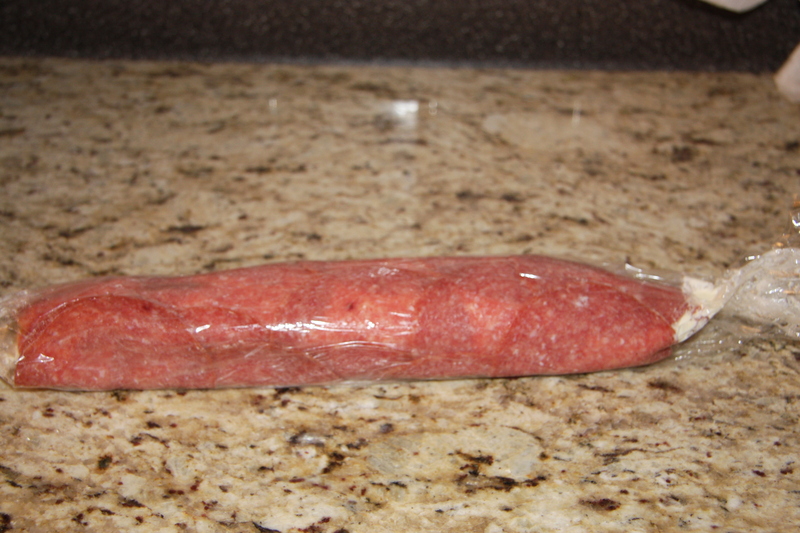 Cover again with saran wrap and flip so salami is on the bottom. 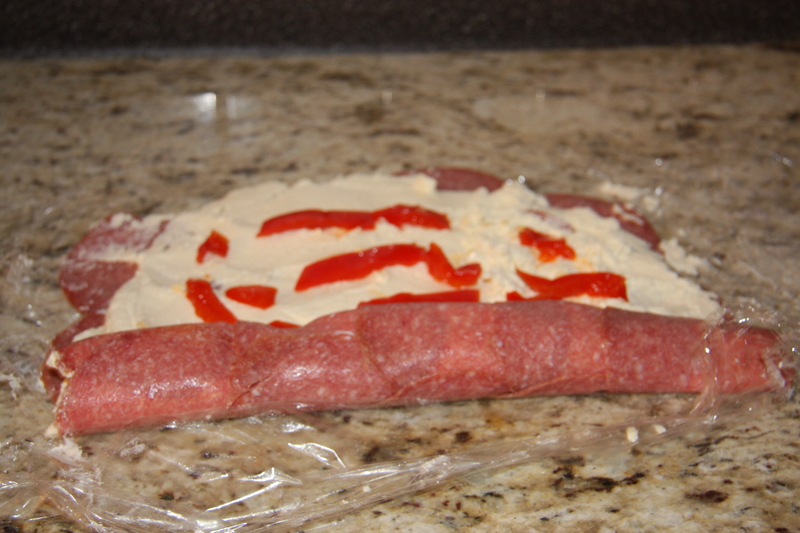 Top this layer with thinly sliced pickled roasted red pepper. 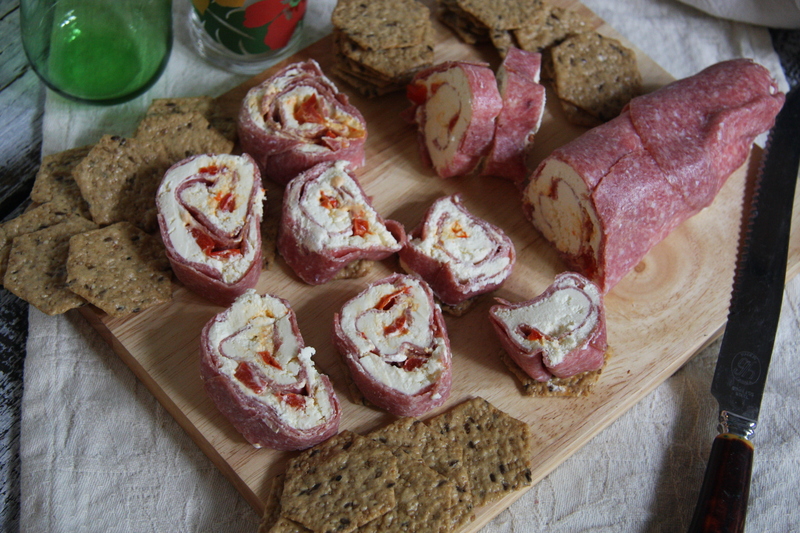 Slowly start to roll up the meat and cheese. 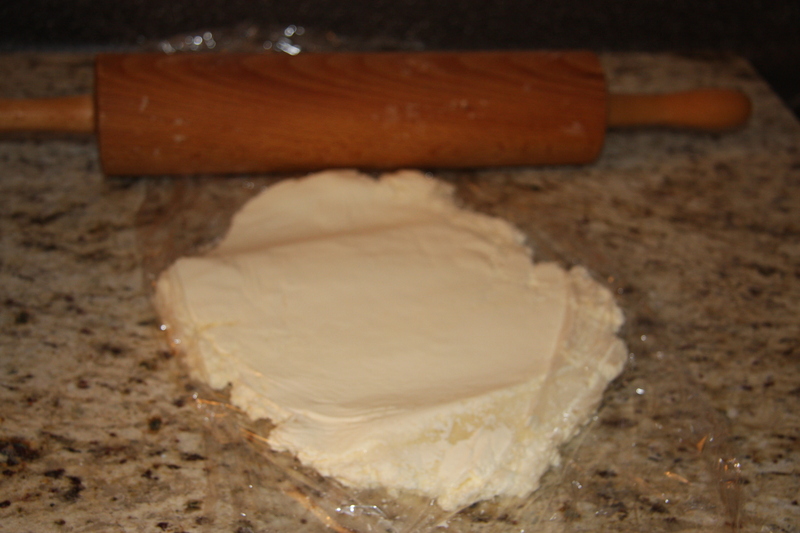 When done tightly wrap the roll in the saran wrap and place in the fridge for 6-8 hours. This makes it easier to slice. Place onto a dish and your good to go. I will try it tomorrow. Looks good.